Please find our Summer 2018 Edition uploaded onto our website! We are now accepting submissions for our next edition. Please refer to the Call for Submissions and Submission Guidelines pages for more information. The next deadline to submit — and be published in our Fall 2018 Edition — is January 20th, 2019. Please find our Winter-Spring 2018 Edition uploaded onto our website, featuring our Student Essay Winner and Honorable Mention, as well as poetry and art! Our contributors this edition join us from Sidney Kimmel, Columbia, Case Western, Northeastern and beyond. We are now accepting submissions for our next edition. Please refer to the Call for Submissions and Submission Guidelines pages for more information. The next deadline to submit — and be published in our Summer 2018 Edition — is August 15th, 2018. Contribute to our Winter 2017-2018 Issue! Anyone is eligible to participate, and all creative works are welcome! Refer to the Call for Submissions and Submission Guidelines pages for more information. And if you are a student…participate in our 1st Annual Student Essay contest, open to all students (undergraduate, graduate, medical, optometry, from all around the world, you name it!). The first place winner will be published on our website. All other submissions will be considered for honorable mentions and publication in the Winter 2017-2018 issue of our journal. The due date for all submissions is February 15th, 2018 by 11:59 PM. All questions and submissions should be emailed to narrativevisions@gmail.com. The Journal of Narrative Visions (JNV) is now accepting submissions for our Spring 2016 Edition. 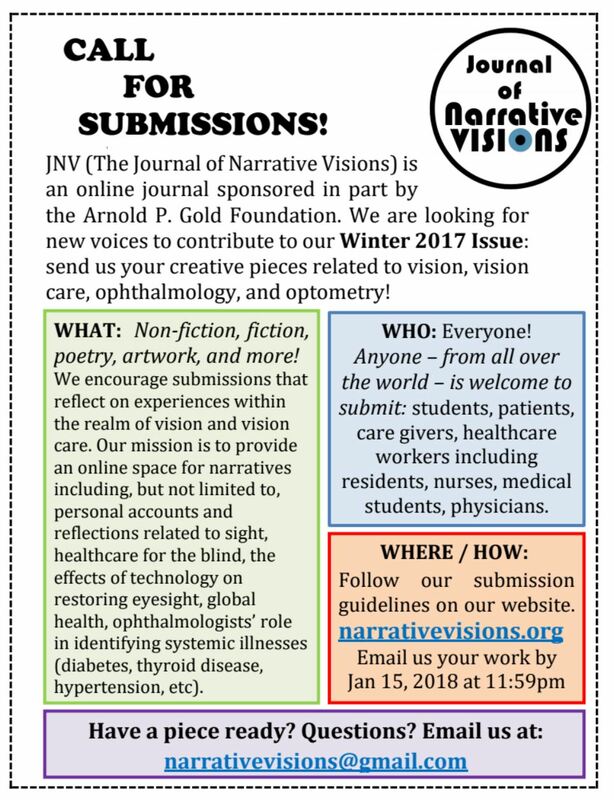 JNV is an online literary journal that accepts narrative medicine and creative pieces related to ophthalmology, optometry, and vision care. We accept submissions including non-fiction, fiction, poetry, and artwork. Topics include, but are not limited to: healthcare for the blind, the effect of technology on restoring eyesight, global health missions, and the role of ophthalmologists in identifying systemic illness (diabetes, hypertension, thyroid disease, etc.). We welcome submissions from ophthalmologists, optometrists, and other healthcare workers including medical students, optometry students, and residents from all over the world. Please find our August/September edition uploaded onto our website, featuring poetry from a contributor at Herbert Wertheim College of Medicine. We are now accepting submissions for our October/November 2015 edition. Please refer to the Call for Submissions and Submission Guidelines pages for more information. Please find our June/July edition uploaded onto our website! We are now accepting submissions for our August 2015 edition. Please refer to the Call for Submissions and Submission Guidelines pages for more information. A good understanding of the anatomy of the eye is essential in order to diagnose common ophthalmic presentations such as ‘red eye’ and interpret findings on ophthalmoscopy, a skill used in many different specialties. However, eye anatomy can be easily neglected as it does not easily fall into larger modules and ophthalmology rotations tend to be short. As a senior medical student or junior doctor you can sometimes find yourself trying to diagnose eye problems using patchy memories of anatomy sessions, mental fragments of onion-like diagrams and the faint recollection of an afternoon spent in a dark room looking at the back of your colleague’s eye. This article aims to provide a simple system to remember the functional anatomy of the eye as well as touch on some basic pathology. Put the hazy memories aside and simply imagine yourself in your room at university. When the room ballot took place luck was not on your side. You live in a spherical cell with only one, small circular window letting light in. Stand facing the window on the opposite side of the room. You are currently in the posterior segment of the eye surrounded by the vitreous humour, a clear jelly-like substance. Your window is the pupil, which lets light onto the wallpaper behind you, your retina. It’s a photosensitive layer made up of light receptors (photoreceptors) that convert light signals into electrical signals which are sent to the brain. Your retina can detach from the supportive connective tissue beneath it much like wallpaper can come off walls, causing vision loss. Through an ophthalmoscope it can even look a little like peeling wallpaper, undulating with bubbles underneath and folds in the surface when it is normally flat and plush to the tissue beneath. This is because a tear in the retina has allowed fluid from the eye to leak beneath the macula and push it off the underlying tissue. 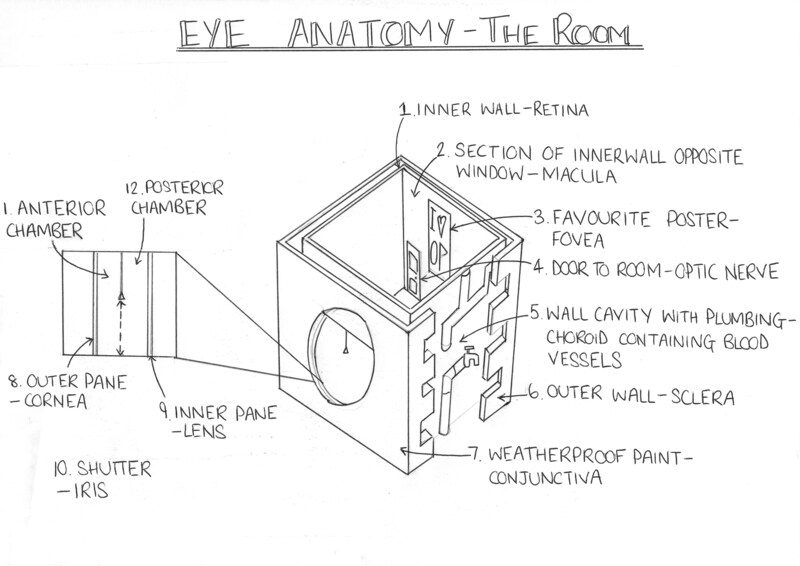 The wall directly opposite to your window, the area of retina opposite your pupil, is called your macula. It has a high density of photoreceptors that allows it to provide your detailed central vision. In the middle of the macula is your fovea, which you can imagine as your favourite poster, the focal point of your room. Your fovea has the very highest density of photoreceptors giving your sharpest central vision which you use for reading and other detailed tasks. Any damage to this area is immediately obvious. Diseases such as age-related macular degeneration – the commonest cause of blindness in the UK – cause central blind spots or distortions in your vision, which can make it hard to read or recognise people’s faces. The information from the photoreceptors in your retina leaves the eye via the optic nerve, which you can imagine as being the doorway out of your room. When this gets damaged such as in inflammation in multiple sclerosis, from ischaemia due to atherosclerosis or from the high pressure of glaucoma, then information can no longer get out of the room causing visual loss. Just because your room is the worst that’s not to say the house wasn’t well built. Your walls are cavity walls. Beneath the innermost wall (your retina) is the cavity, filled with all the things that keep your room functional, notably the plumbing. This is the choroid, the vascular layer of the eye which contains blood vessels in a loose network of connective tissue. Your outermost wall obviously needs to be a bit more sturdy as its exposed to the elements. So covering the choroid is the sclera, the white of your eye, which is tough and fibrous. At the front of your eye the sclera is covered in a special protective layer, not unlike a layer of weather-resistant paint to protect you from the elements. This is your conjunctiva, which also covers the inside of your eyelids. However, just as you wouldn’t paint over your windows, the conjunctiva does not cover the cornea, allowing unaltered light to enter the eye through this window. The conjunctiva consists of stratified squamous and stratified columnar epithelium with mucus secreting goblet cells, which provide protection and lubrication to the eye. It also produces a small amount of tears. The conjunctiva is well supplied by blood vessels, which fill with blood when it becomes inflamed just like any other tissue. When the vessels fill with blood the conjunctiva is said to become ‘injected’. This is ‘red eye’, and it is a handy indicator that something is wrong with your eye. The window to your eye is effectively double-glazed. Its outer pane is specially designed to be as clear as possible for you to look out of. This is your cornea. It has no blood vessels so as not to affect your vision, receiving all its nutritional needs via diffusion from your tear film or the aqueous humour. Your eye doesn’t like things interfering with the cornea, just like you wouldn’t like people messing with your window, it spoils the view. Your cornea is well innervated by the ophthalmic division of the trigeminal nerve, if anything affects your cornea you’re going to know about it- that is if you can’t see it already (this is your window remember). This is why something scratching your cornea (a corneal abrasion) or causing inflammation of your cornea as in bacterial or viral keratitis is going to cause you a great deal of pain. Your eye is also going to want to get rid of this nuisance by stimulating the tear glands to produce tears in order to wash it away. There will be a general increase in blood flow to the eye just like any other tissue when damaged. This is going to cause your conjunctival blood vessels to become injected, causing a ‘red eye’. The inner pane is your lens. Like the cornea it is clear and doesn’t interfere with light before it hits your retina. Therefore it has no blood vessels, receiving nourishment from the aqueous humour, and it is made up of proteins called crystallins, which as their name suggests are crystal clear. With age these proteins can denature and break down, causing a clouding of the lens and associated vision loss called cataract. The lens has a convex shape, wider in the middle than at the ends when viewed side on, meaning it focuses light from outside your window onto your retina, forming images. This focusing power can be adjusted by the ciliary muscles under the influence of parasympathetic fibres travelling in the oculomotor nerve (cranial nerve III). Between the two panes of your window is a shutter which can open or close to let more or less light into your eye depending on how much of it is hitting your retina. This is your iris, which varies in colour between individuals according to how much pigment it has. It optimises the amount of light entering the eye by microsecond adjustments, constricting or dilating under the influence of parasympathetic or sympathetic nerve fibres respectively. This activity requires nutrients, so your iris is well supplied with blood by the ciliary arteries. This constant movement of the iris means that when it is inflamed (known as iritis or anterior uveitis) it is painful and made worse by bright light, described as ‘photophobia’. Iritis is an autoimmune condition being associated with the gene HLA-B27 and related conditions such as ankylosing spondylitis. The iris also divides your double-glazing system- collectively called the anterior segment of the eye, into an anterior chamber and a posterior chamber. The anterior chamber is from the cornea (outer pane) to the iris, whilst the posterior chamber sits behind the iris and in front of the lens (inner pane). Both these chambers are filled with a liquid called the aqueous humour. This is produced in the posterior chamber by the ciliary body (which helps support the lens) and reabsorbed into the bloodstream in the anterior chamber through a system called the trabecular meshwork which drains into Schlemm’s canal. Glaucoma can be caused by over production or poor drainage of the aqueous humour (along with other rarer causes), causing a build up of pressure in the anterior chamber, which affects the whole eye. If you imagine having a party in your room where you kept letting more people in and but no one was leaving, you would soon start to notice the damage, particularly to anything delicate. This is what happens in glaucoma, where a raised pressure in the eye causes damage to your optic nerve fibres, decreasing the available channels for signals to your brain and causing a progressive loss of vision in advanced glaucoma, although the disease can progress up until this point without any noticeable loss of vision. There are two types of glaucoma. The first is angle closure glaucoma, where the ‘angle’ between your cornea and your iris is narrow, causing poor drainage of the aqueous humour. Hypermetropes- people who are long sighted, have small eyes and so are more susceptible to angle closure glaucoma because everything is a bit more cramped – a bit like trying to open an inward-opening door when the room is already too full. This can rapidly get out of control, with very high pressure, pain and blurred vision. The second type is open angle glaucoma, which is where the angle itself is open but there is a problem with drainage through the trabecular meshwork. Open angle glaucoma is less dramatic since it does not cause such high pressures, but is much commoner and worryingly can be silently causing damage to your peripheral vision without you noticing – superficially more civilised, but if you let it carry on your stuff gets trashed just the same. The eye is an amazing and beautiful organ. It manages to be delicate enough to achieve the remarkable function of vision, and yet robust enough that in most people it will continue to function without ceasing into old age. The common conditions that we have outlined here are major causes of sight loss worldwide but advances in ophthalmology are now providing treatments for many, and hope for the future. Bio: Trystan Macdonald is a fifth year medical student currently studying at the University of Birmingham, UK. He has a keen interest in academic ophthalmology as a career and has presented work at conferences around the world. Having day dreamed in too many pre-clinical lectures he looks for novel and creative ways of teaching basic science that people can understand and remember.